I love to run. Not only do I love to run, but I love to race, and I do so quite often. In this day and age it's just a click of a button and a punch of a few keys to sign up for really any kind of race. And usually the experience of running a race is empowering, addictive, and wonderful. In addition to family and friends; the cheer of the spectators, the friendliness of volunteers, and the support of the race staff make running a race an incredible experience. So much so that it's hard for me to imagine a day when women weren't just unwelcome, but unwanted on the race course. In fact, there was a time where the general opinion was that women were "too fragile" to run. In 1966, Katherine Switzer decided she wanted to run the Boston Marathon. Her coach Arnie had run it 15 times and regaled her with tales from the marathon. She enjoyed hearing about the run, the challenge, the camaraderie and decided then that she wanted to run Boston. After much convincing, to the point where she ran over 20 miles with Arnie, he decided to coach her for this distance. She registered for Boston using her initials, KV Switzer, the way she usually signed up for events and activities. What struck me most about Katherine was that she wasn't running Boston for any reason other than to run. She says, "I wasn’t running Boston to prove anything; I was just a kid who wanted to run her first marathon." Fast forward to Marathon Monday 1967. After months of training, she was finally there at Boston. Katherine wanted to look pretty for the run and had picked out a cute set of shorts and a shirt. The weather, however, wasn't going to have it and she sported grey sweats over her outfit. She pinned her bib, #261, onto that sweatshirt. At that time, grey sweats were a popular choice in running apparel and many of the men were running in just that. In fact, when the other runners at the start saw that there was a woman in their midst, many of them were supportive, even asking her if she could get their wives to run. The race began and the first few miles felt good. Katherine was running with Arnie, her boyfriend, and a teammate from the cross country team. The press bus drove by and that's when everything seemed to go wrong. Jock Semple, the race director, was riding on the press bus when he spotted Katherine. He was furious! He didn't want a woman running in his race. He jumped off the bus and ran at her shouting loudly, trying to physically remove her from the course. He grabbed at her sweater and tried to pull off her bib. Katherine was terrified! All of a sudden her boyfriend, Big Tom, tackled Jock to the ground. The group then turned and ran off much faster than before. Katherine was shaken and considered quitting right there. She didn't come to Boston to make waves, she came to run. But then in that moment she realized something, "I knew if I quit, nobody would ever believe that women had the capability to run 26-plus miles. If I quit, everybody would say it was a publicity stunt. 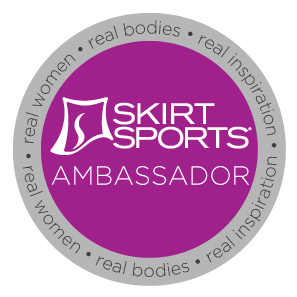 If I quit, it would set women’s sports back, way back, instead of forward. If I quit, I’d never run Boston. If I quit, Jock Semple and all those like him would win." She didn't quit. She ran, and she ran straight into history. She showed the world that women aren't frail, they are strong. That they can run marathons, and yes they can even run Boston. Katherine broke through barriers for women without even intending to. Through her love of running, she proved to the world just a taste of what women are capable of. 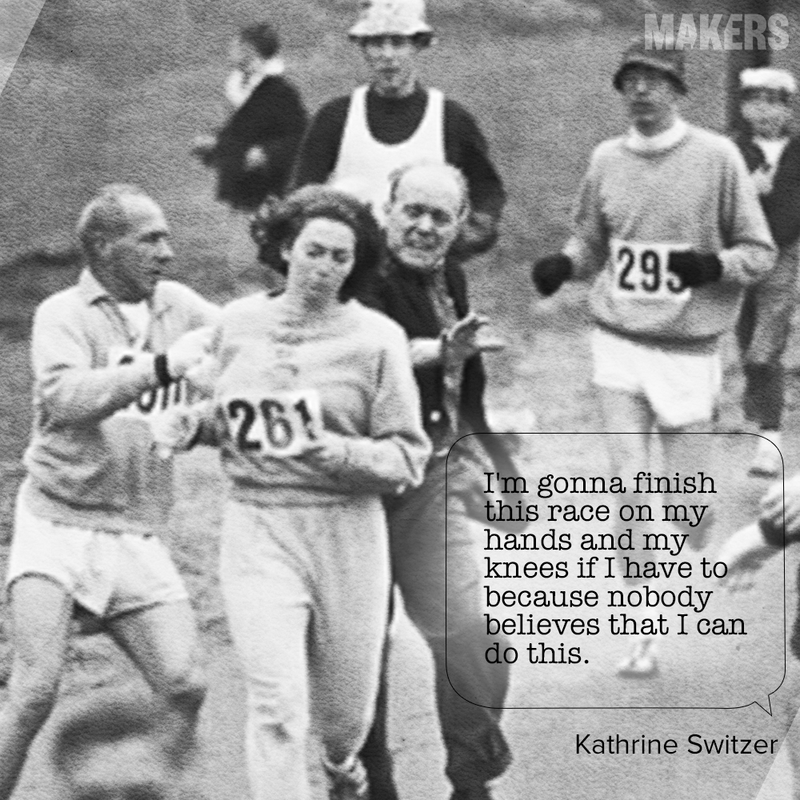 Katherine went on to be a strong advocate of women's running. Through her work, and that of many others to actually include Jock Semple, women were now welcome to run the Boston Marathon in 1972. She founded the Avon Running Global Woman's Circuit, a running circuit for women and the first of its kind. Katherine's story in her own words is on her website and in her book Marathon Woman. I love how she changed the status of running for women! Agreed! Her accomplishment inspired me to sign up for my first marathon. Seriously! It's hard to believe the challenge it was for women to do anything physical even just a few decades ago.